Tech Neck... It's a real thing in Westminster MD! Tech Neck... It's a real thing! Did you know that staring down at a mobile device places 60 pounds of pressure on your neck? Ouch! Imagine holding an 8-12 pound bowling ball with two hands close to your body. Now imagine holding that same ball with your arms stretched out in front of your body. Which is harder? Holding the ball out in front of your body is much harder than keeping it close against the body. The same is true for your head (bowling ball) and cervical spine (arms). When your head is in front of your shoulders, the muscles of the neck and upper back have to work harder to hold it up. This is one of the most prevalent causes of upper back and neck pain. 1. Limit your electronic usage– I know it sounds simple, and it actually is that simple. 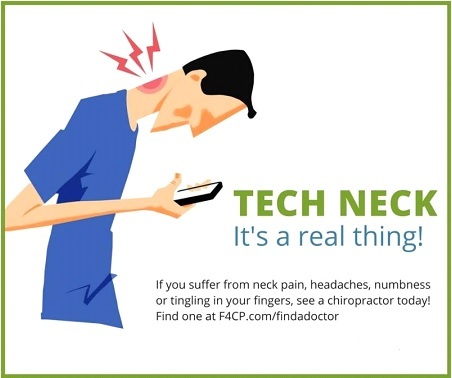 Take time away from your phone and give your neck a break! Trust me you will be okay without Facebook or Candy Crush for a few hours. 4. Perform neck stretches– The cervical (neck) ranges of motion are a very easy and effective way to stretch your neck. Perform them in the shower with the hot water hitting on your neck and upper back (to help encourage relaxation) or while you are watching T.V. 5. Cervical Ranges of Motion– Go through the following 6 ranges, 2-3 times/day: tuck your chin to your chest (flexion), look up to the ceiling (extension), bend your ear to your shoulder, both sides (lateral flexion), turn your chin to your shoulder, both sides (rotation). The key is to go until you feel restriction, but not past it! Hold for 5-10 seconds. Do NOT force the motion. 6. Use a Cervical Roll– After a long day at work (or on your phone); your neck needs a break. The neck is supposed to have a natural C-shaped curve, but as I mentioned before, it can be flattened or even reversed. A simple way to help get the curve back is the use of a cervical roll. Take a small hand towel and roll it up length-wise. Once it is rolled you can put a rubber band or duct tape around it to keep it rolled tight. Now laying on your back on a flat surface, place the roll at the base of your neck so your neck naturally curves around it. Do not put it under your head. If your head is propped up you need to move the roll lower down your spine. Relax and rest on the cervical roll for 15-30 minutes/day. 7. Get Adjusted! – After low back pain, neck pain is the second most common reason people see a chiropractor. Chiropractic adjustments will help restore normal joint function and can reduce/eliminate muscular tension.